This backyard makeover includes a stamped concrete patio, a concrete-capped stone fire pit, seat walls, and concrete countertops, all integrally colored the same tone, but finished differently to create natural contrast. 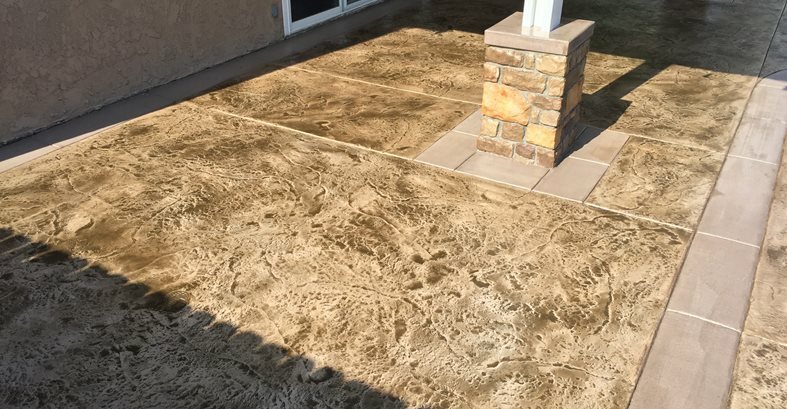 A texturing stamp was used to give the patio a rough stone texture, and the bands around the textured concrete were given a light broom finish to create contrast. A translucent color wash applied by brush settled in the low spots to replicate the veined look of natural stone. To create a consistent look throughout, the same integral color was used for the concrete countertops and the caps on the stone fire pit and seat walls, but these surfaces were given a smooth, hard-troweled finish. For some decorative concrete projects, the use of simple tools and techniques can achieve the most impressive results. 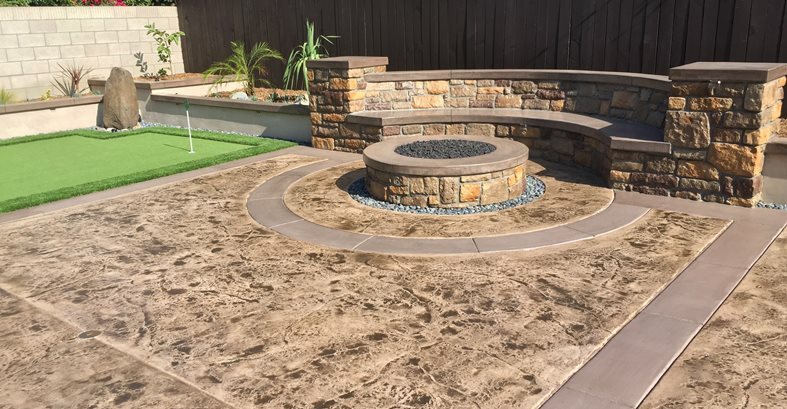 For this backyard makeover in Costa Mesa, Calif., a concrete patio was given the veined look of natural textured stone using one color of antiquing stain hand applied with a small brush. The project also included a concrete-capped stone fire pit, seat walls, and integrally colored concrete countertops. “The owner had a completely fresh palette to start with. I suggested using integrally colored concrete throughout, but to apply different finishes to that one color. When stained and sealed, all the concrete would have a contrasting look,” says contractor Kevin Brown of KB Concrete Staining, Eastvale, Calif.
A texturing stamp was used to give the patio a rough stone texture, and the bands around the textured concrete were given a light broom finish to create contrast. 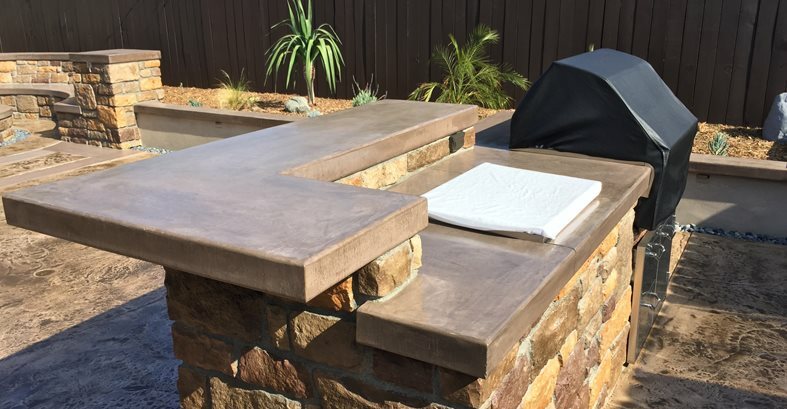 The same integral color was used for the concrete countertop and the caps on the stone fire pit and seat walls, but these surfaces were given a smooth, hard-troweled finish. After allowing the concrete for the patio to cure, Brown applied an antiquing stain from New Look, called TiqueWash, using a 4-inch round brush. The stain is a powder that when mixed with water creates a translucent color wash that settles in the low spots of textured concrete to create a natural-looking, multi-toned finish. “Every job that is stained is never the same. When you have a good texture and a consistent finish, the end result can be so incredible when stained and sealed,” says Brown. KB Concrete Staining, Eastvale, Calif.